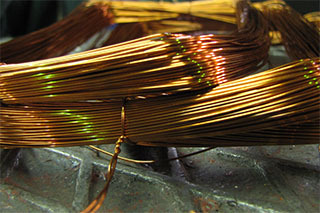 Copper wire. Creative Commons Attribution-Share Alike image by Taran Rampersad. Electrical currents flow easily through metals, but not through most other materials. This is not an absolute yes/no property: different materials vary in how easily they allow electrons to move through them. They resist electron flow to different degrees, and the amount that they resist is a measurable property which we call, appropriately enough, electrical resistance (usually shortened to just resistance). The resistance of a piece of wire, or of any object in fact, is measured in units called ohms, named after Georg Ohm, a German scientist. The unit of ohms is symbolised with the Greek letter capital omega, Ω. A shortish piece of wire typically has a resistance under 1 Ω, while a chunk of wood or plastic might have a resistance of many billions of ohms. The resistance of an object depends on its size, as well as what it's made of. Generally speaking, a length of wire twice as long as an otherwise identical piece of wire will have a resistance twice as large. On the other hand, a piece of wire twice the cross sectional area (think of two bare wires twisted together) has half the resistance of the original wire. In a similar way to how the mass of an object depends on the volume of the object and the density of the material, the resistance of an object depends on its length, its cross sectional area, and the resistivity of the material. You can't talk about the "mass of copper", you can only talk about the mass of a piece of copper of a certain size, which is determined by the density of copper. In the same way, you can't talk about the "resistance of copper", you can only talk about the resistance of a piece of copper wire of a certain length and thickness, which is determined by the resistivity of copper. Metal conductor indicating resistance value. Creative Commons Attribution-Share Alike image by Steve Krave. As you should expect by now, the resistivity of copper is pretty low, while the resistivity of wood or plastic or in fact most materials that aren't metals, is pretty high. The resistivity of copper is 1.68×10-8 ohm metres, which means a piece of copper one metre long, with a cross-sectional area one millionth of a square metre (quite a thick piece of wire) has a resistance of just 0.0168 Ω. In contrast, the resistivity of wood is about 1015 ohm metres (it varies by the type of wood), which means a piece of wood the same length and thickness as our copper wire has a resistance of a whopping 1021 Ω. All well and good so far, but what happens when you hook up something like this to an electric potential difference, or voltage? The voltage applies a potential energy to the electrons in the wire, and they start moving. How fast they move depends on the resistance. The most useful way to measure the speed of the electrons is not to measure it in terms of metres per second, but rather by how much electric charge moves past a given point per unit of time. This is similar to how flows of water are measured. We don't measure the speed of flow of a river or waterfall using metres per second, but by how much volume of water flows by each second: litres per second (or megalitres per second for big rivers). 240 volts. Creative Commons Attribution-Share Alike image by Andy Davison. where V is the voltage, I is the electrical current, and R is the resistance. This relationship was discovered by Georg Ohm, and is called Ohm's law. So if you take a copper wire with a resistance of, say, 1 Ω and you apply 1 volt (V) of electrical potential difference across it, this will set up an electrical current within the wire of 1 ampere (A). One ampere (1 A) is actually quite a lot of electrical current. Some household appliances draw around 1 A, and some draw more than that, but many draw less. In my home, the circuit breakers are set to trip if the current reaches 10 A. (This is standard in Australia, where the domestic power supply is 240 V, but differs around the world.) If you were to stick a piece of copper wire with resistance 1 Ω across the terminals of a 240 V supply, the current would be 240 A, or at least it would be if you didn't blow every circuit breaker and fuse in the area. And if you didn't trip any of these safety measures, 240 A would melt the wire pretty quickly and dangerously. (And an actual copper wire would have a resistance significantly less than 1 Ω, making this even more stupidly dangerous.) So the electrical devices we plug into our power sockets generally have overall resistances (between the terminals of the plug) of the order of 100 Ω or more, bringing the current down to just a few amps or less. 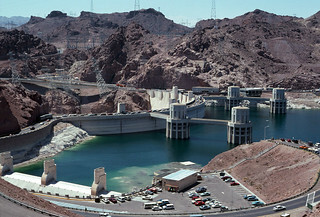 Hoover Dam hydroelectric power station. Effectively a lot of water made to go over a big artificial waterfall. What electricity does for us can be summed up quite easily: it delivers energy. Various electrical devices use that energy to perform different tasks: illumination, heating, cooling, sucking up dust, playing music, displaying movies, calculating spreadsheets. All of these things need energy, and some of them need more energy than others. If V is in volts and I is in amperes, then P is in watts (W). You can use this relation to work out how much current any of your appliances draws from the mains supply. My vacuum cleaner is labelled as 2400 W of power, which means that's how much power it uses when running. Since the voltage of my power supply is 240 V, this means the vacuum has to have 10 A of current running through it to use 2400 W. This is the maximum power any appliance can use in my home before tripping the circuit breakers. A 10 W light bulb, on the other hand, uses a relatively small 0.042 A of current. A device that uses electricity and makes heat: a refrigerator. Once current is flowing through a device, where does the energy being delivered go? We have designed our electrical devices to do things we consider useful, and much of the energy goes into that. But the second law of thermodynamics, you may recall, says we can't break even. The energy that we get out to do useful work cannot be equal to the energy that we must put in (in the form of electrical power). Some fraction of the energy is wasted, and that wasted energy appears in the form of increased motion of atoms - heat, in other words. This is why every electrical appliance you run gets warm or hot. Some, of course, are designed to get hot—we call them heaters or toasters or ovens—and that's all they do. But lights get hot, vacuum cleaners get hot, your TV gets hot, even your refrigerator gets hot. The inside of a fridge of course gets cold, but it does it by moving the heat energy from the inside to the outside, radiating it away from the cooling coils on the back, while also adding in extra heat from the electrical power used to pump the heat. Similarly, air conditioning cools your home by warming up the air outside even more. And waste heat is one of the biggest issues with complex electronic devices like computers, which is why they have heat sinks to draw heat away from delicate components and fans to dissipate that heat into your room. Even the wires that carry electricity around heat up. As we've seen, a piece of copper wire has a very low resistance, but it's not zero. If we take our two equations V = IR and P = VI, we can combine them to eliminate the voltage V, giving the new equation P = I2R. This means the power dissipated in any object carrying an electrical current is equal to the square of that current times the resistance of the object. If a length of copper wire with a resistance of just 0.01 Ω carries a current of 10 A, then the power lost in the wire itself is 1 W. This power goes directly into heating up the wire - it is not available to do useful work in the appliance that the wire might lead to. It is, to put it bluntly, wasted. Naturally, we would like to minimise wastage of power. Wastage of electrical power is not actually such a big deal in your home, where the wires are only ever a few metres long. Where it really bites is in the transmission of electrical power from power stations, which may be hundreds of kilometres away, to your home. 100 km of copper wire, at about 0.01 Ω per metre of length, comes to a resistance of the order of 100 Ω. If the power station generated power at an electrical potential difference of 240 V, this means there would be a current of 2.4 A flowing through the power transmission lines. Squared, and times 100 Ω, that gives a power loss of 576 W just in the cables leading from the power station to your home. Multiply this by a few million buildings... and you are wasting more than a gigawatt of power! Wasting it! Just throwing it away, using it to heat up wires! Most power stations only generate a few hundred megawatts to a gigawatt or so of power - they would be losing essentially all their generated power just in waste heat in the transmission wires. High voltage power transmission lines. 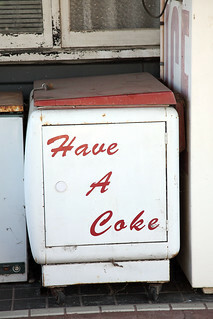 Creative Commons Attribution image by Flickr user Deptford John. Clearly this is not how things are done. The solution is to realise that the power wasted depends on the square of the electric current in the wires. (P = I2R) If you reduce the current a bit, you can reduce the wasted power quite a lot. But we still want to transmit the same amount of power out of the power station. Now recall that power is equal to voltage times current (P = VI). 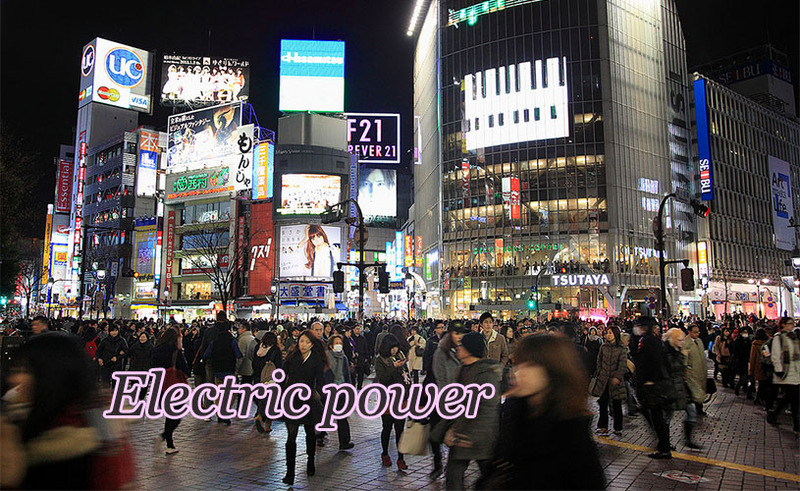 We can reduce the current but maintain the power by increasing the voltage. And this is exactly what electric companies do. 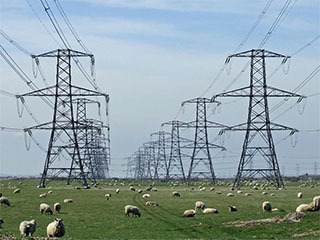 The large power cables and towers that carry electricity from our power stations across countryside and into our cities operate at voltages around 800,000 V. The power leaves the power station at this voltage so that the total current passing through the transmission lines is limited to match the power being generated. In our simple example, we are multiplying the voltage by 3,333 times, and so reducing the current by the same factor (thus keeping the power leaving the power station the same). The wires now carry only a minuscule 0.00072 A of current, and the waste heat generated in the wires is only 0.000052 W. Multiply by a few million houses, and the total power lost in the transmission wires is now only a few hundred watts, instead of over a gigawatt. Much more reasonable. And this is why electrical power is transmitted over wires at the highest practical voltage possible - to minimise the power lost to waste heat in the wires. 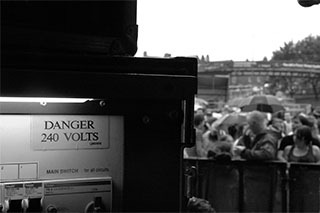 High voltages do present some problems - they are extremely dangerous for one. So we keep our electrical infrastructure well away from anywhere that people could come into contact with it. It is intimately related to magnetism. There is a slight complication in this, because household power uses alternating current rather than direct current, but the statement is true in essentials. Alternating current is a topic for another day. Named after James Watt, who didn't have anything much to do with electricity, but did do a lot of stuff with steam engines, which were generating power long before anyone used electricity for anything practical. 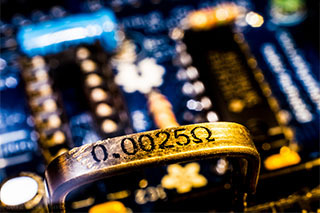 There are materials that have zero electrical resistance. We call them superconductors. But they are rare and exotic and expensive, and not currently used in any household appliance that doesn't have the words "Hadron Collider" in its name somewhere. More than enough to power a DeLorean time machine. Last Modified: Tuesday, 3 September 2013; 01:12:25 PST.